True North Movement is a vinyasa yoga studio that explores mindful, intentional movement in alignment with our true north. Our mission is to assist students in the development of self-awareness, compassion, and gratitude practices; to offer freedom in each movement and every moment to our community. Founder of True North Mo(ve)ment, Jacquie is a registered yoga teacher from York, ME. Her 200 hour Yoga Teacher Training took place at 3 Bridges Yoga, and her Advanced Yoga Teacher 300 hour Training with Jacqui Bonwell. Jacquie has also been trained in Balanced Athlete® with Johnny Gillespie, Ball Rolling with David Vendetti, Chakra Yoga with Anodea Judith, and Yin/Meditation with Sagel Urlacher. Jacquie is motivated to share the teachings of the practice by her personal experience: yoga allows her to ground down to her core values, to participate in each moment (with a light heart), and to be at home with herself. Using patience, compassion, perspective and wisdom, her mission as a teacher is to help students find their true north. Niki is a E-500 RYT and Reiki Master from Portsmouth, NH. She spent eight months as a residential seva volunteer at the Kripalu Center for Yoga and Health, completed her 200 hour teacher training with Yoga Works in 2013, and travelled to southern India to continue her training and earned her 500 hour advanced certification through Sacred Lasya. Niki has trained in Reiki with Libby Barnett and Maureen Miller, Restorative Yoga with Erin Elhers, Balanced Athlete® with Johnny Gillespie, and Yin Yoga and Meditation with Sagel Urlacher. Niki shares her passion for mindful movement throughout the NH and ME seacoast and on yoga retreats near and far. Carson was introduced to the world of yoga in Costa Rica in 2015, and has never looked back. 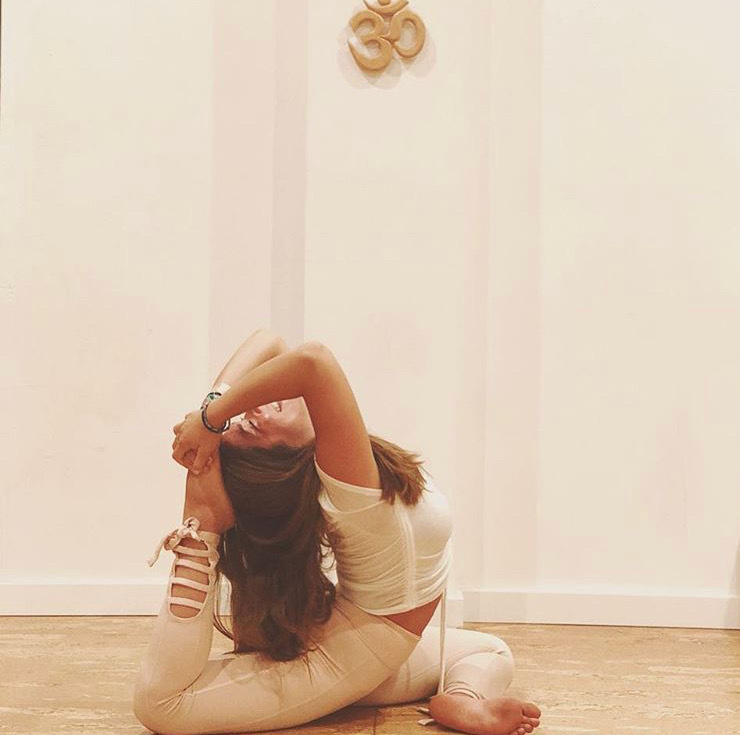 She has always loved going to yoga classes as a student, but as she started to practice on her own, she became curious and interested in teaching other people. Though there was some initial fear behind teaching, she knew this was the direction she wanted to take in her life. She is a student at the University of New Hampshire studying Nutrition Health and Wellness, and her goal is really to educate her yoga students about the relationship between our physical and emotional bodies. She encourages her students to be their authentic selves and to honor their truth. Carson received her 200 RYT certification from the Kripalu School of Yoga in June, 2017. Becca Medvin is from Miami, FL, where she became a 200-hour certified instructor in Vinyasa, Power, Yin, and Restorative Yoga. She has been a yoga student since she was 13 and has taught for the last 6 years. Her personal experience with the transformative and healing powers of yoga moves her to help others discover and experience the practice for themselves. Becca's journey as a student and teacher has taught her how capable we all are of taking up more space and feeling good in our bodies, and she seeks to guide students into recognizing the spaciousness, freedom, and presence that's already within them. Katie truly connected with yoga when she was in nursing school. Yoga helped her to find alignment not only in her physical body, but in her life. It opened her eyes to the power of managing stress, moving the body in a healthy way, and living in alignment with one’s truth. Katie left her career as a cardiac nurse to pursue her passion of yoga. Katie completed her 200H training at 3 Bridges Yoga in Portsmouth. Since then, her personal healing journey has led her to further her education and become a Reiki practitioner, holistic health coach and stress relief instructor. Katie is excited to be integrating her love for yoga and Reiki into her health coaching practice, Katie O’Connor Wellness. Hayley began her yoga practice fifteen years ago to find relief from a sports injury. The physical practice quickly became so much more and a dream of sharing yoga with others through teaching soon took shape. Hayley received her 200 hr certification in 2015 with 3 Bridges Yoga and began teaching adults and children soon after. Hayley loves being part of the community that comes along with the journey of yoga. She strives to bring to her classes a sense of personal experience and exploration alongside thoughtful and physically challenging sequencing.